Start your kayak holidays planning with an overview of most inspiring paddling places we've been to in Croatia. It's a distilled list from of years of paddling (and having our camera with us). 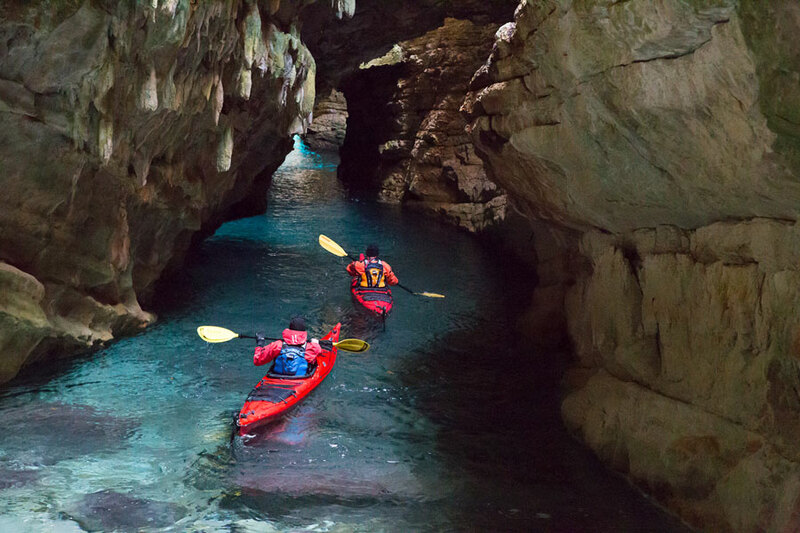 It will be very hard to connect all the listed spots in one trip, so this makes a returning list of inspiration for your kayak holiday in Croatia. Kayak holidays in Croatia are about more than just the sheer joy of paddling beautiful landscapes, crystal clear waters and island hopping. It is about seeing historic and military sights, century old towns and fishing villages, cliffs and grit of everyday life of local people living by the sea. With this post I want to share with you some of the most epic spots, kayaking anecdotes and stories from sea kayaking Croatian coast. If you are starting to plan your kayak holiday in Croatia, this collection of insights is inspiration and a natural place to start designing your trip. One thing that makes kayak holidays in Crotia so unique is the turbulent history of the country. Even more so, elements of that history that are still visible today. Many of them are best visited in a kayak. 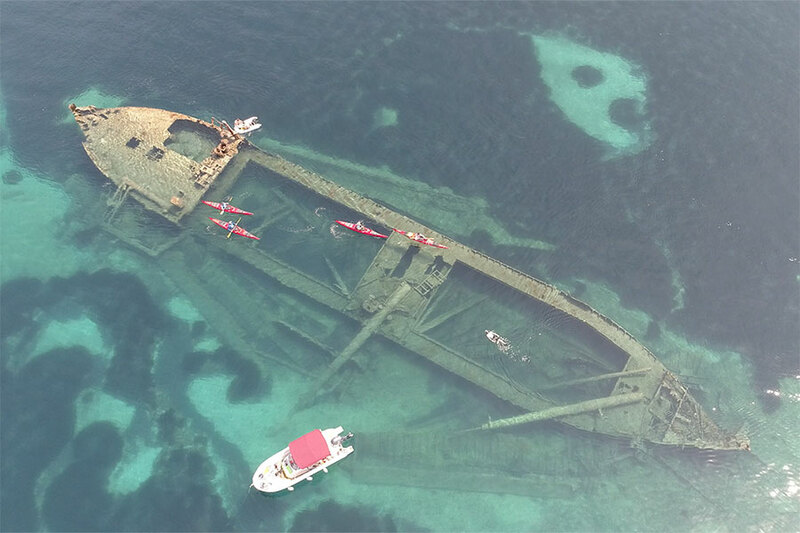 This is as close as you will ever get to a shipwreck with your kayak in Croatia. Literally paddle over the 70m long ship with its, now underwater, cargo sections. Today, ship is a home for showls of fish that hide there. 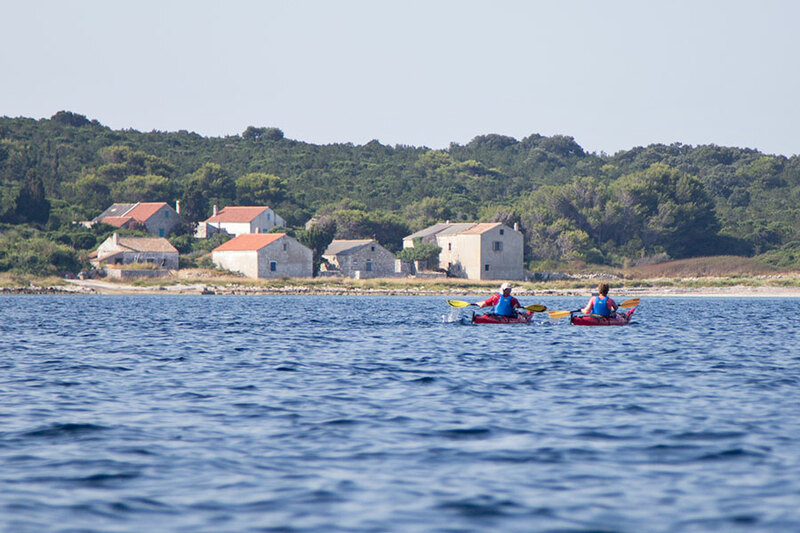 If you are there, complement your kayak holidays with a paddle over to islands Lagnići. Expect shallow waters and some beautiful views of nearby lighthouse Veli Rat. Highly recommended even if you don’t plan to go for a dive as you keep your kayaks anchored near the shipwreck. Please note that in June, July and August there may be some people snorkelling around from the nearby anchored chartered sailboats. Best way to access the spot: kayaking trip or gear rental in Molat. Paddle inside an island and literally into military history. 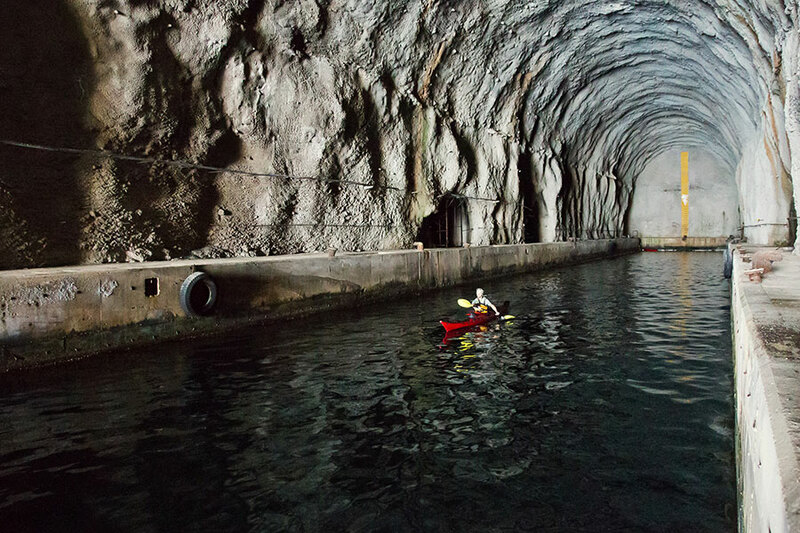 One of the most unique kayaking experiences in Croatia is to paddle deep inside an island to places where Yugoslav submarines used to dock and hide. Systems of such submarine caves are to be found on several spots along the Croatian coast - every place that was of strategic naval military importance. 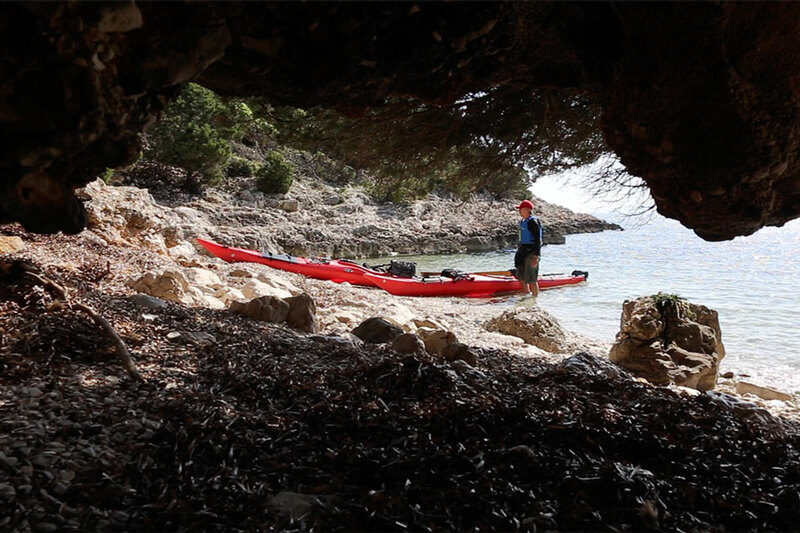 However, the best we have paddled to are the submarine caves on Dugi Otok around villages Dragove and Božava. Paddle over to island Ilovik. Take your kayak out on a south facing pebblestone beach. Walk around to find former military infrastructure like water tanks, wells, cemented platoes now overgrown with self-grown medicinal plants and maquis. It doesn’t take long to start feeling like a soldier from Cold War period. A little path to the west leads to another discreet and baren cemented wall and roof. In the middle of it is thick rusty door. A staircase leads down some 50 steps and you find yourself in the underground military tunnel system that goes on for kilometers. See more about this trip in our video and story about circumnavigating island Lošinj. Best way to access the spot: gear rental from Molat. Take some limestone - easily soluble rock. Sediment it. Make some tectonic movement. Add water. Come back millions of year. What do you find: beaches, cliffs, and caves - scattered on archipelago of 1244 islands, islets and stone stacks. Nature is a big reason to do your kayak holidays in Croatia. Imagine pebblestone beaches every kilometer as you paddle the coast and no roads or people in sight. That’s what you get in west coast of Lošinj. It’s coast line is cut off from rest of busy island Lošinj by the Osorčica mountain range. Entire coast is accessible only by the sea. It is one of those remote spots that are harder to reach and reserved for more seasonal paddlers. Sea state in that part of Croatia is much more affected by both Jugo and Bura winds. 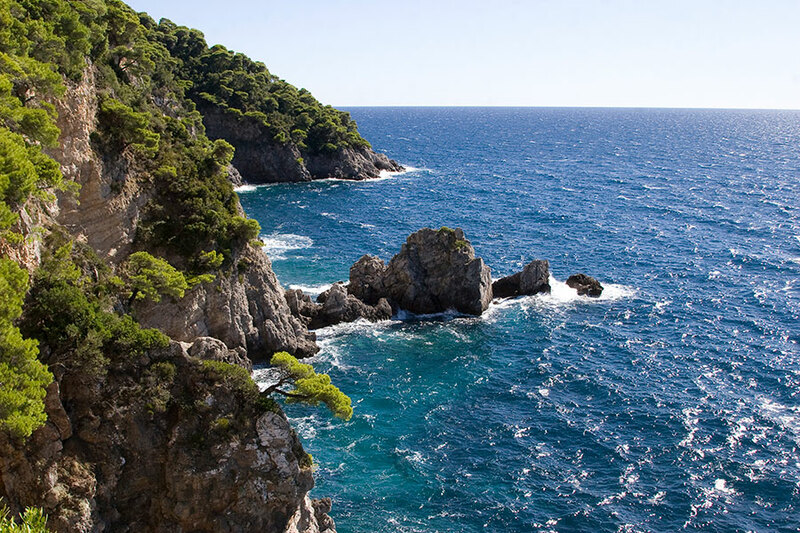 Take look at a story and video about circumnavigating island Lošinj. Best way to access the spot: own kayak (or gear rental from Molat). Brbinjšćica is one name of this cave. Golubinka is a colloquial name. Golub in Croatian means pigeon. In the archipelago around Zadar there are a number of caves that have the same name: Golubinka. It stems from pigeon nesting grounds as they regularly hang out in those predator-free environments. Golubinka on Dugi Otok is by far the biggest and most exciting cave in the whole archipelago. It is around 50m long zigzag through the cave and fallen boulders ending with an opening – a sinkhole. That gives it enough light so you can paddle there without a flashlight. Take a look at a video about our cold winter paddle there. Officially, the densest archipelago in the Mediterranean is Kornati National Park. 89 islands scattered over 35 square kilometers. Their name comes from Krone/Korone – crowns or cliffs formed by the most distant western facing islands. 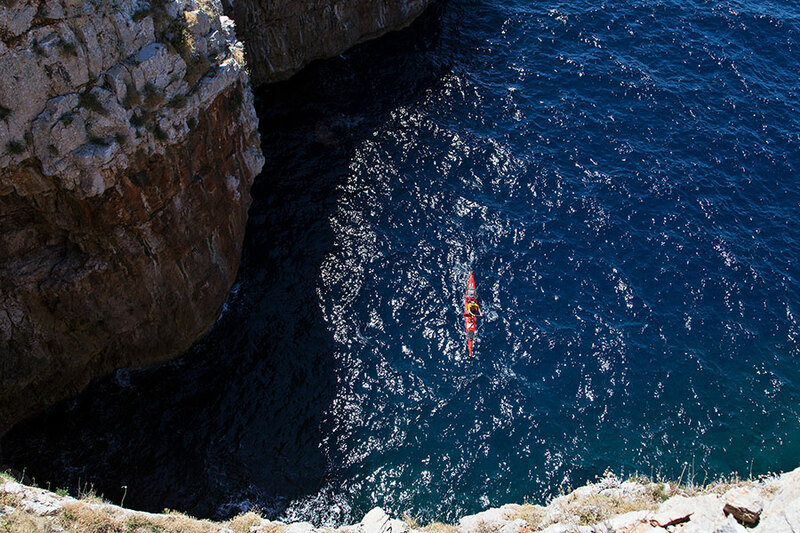 If you want to paddle to cliffs in Croatia, this would be one of the best spots. To the above experiment (limestone, tectonic forces...), add human element. Start with first settlers before Greeks came in 4 century BC. Come back centuries later. What do you find? Out of those 1244, only 69 islands are inhabited. People that live there have their stories to tell. Fact is that island life is in decline in Croatia but also in many other island nations, like Scotland, Ireland. 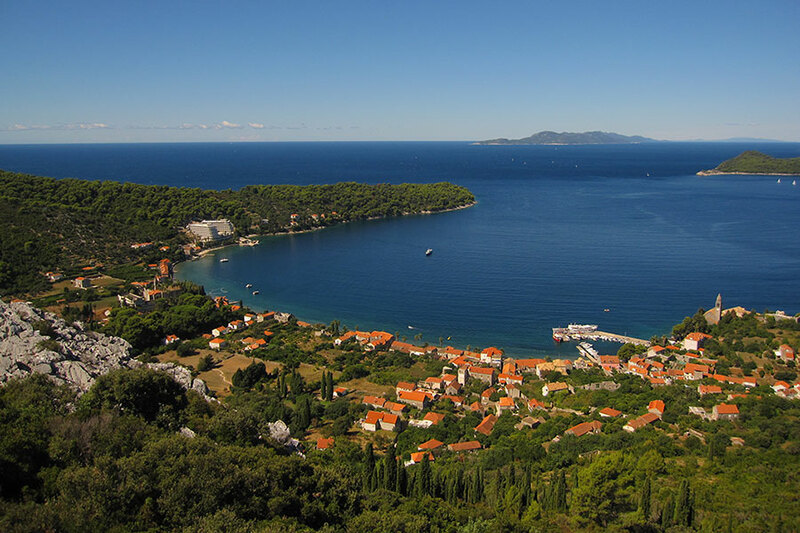 Unlike in Spain and Italy, where islands are big and few, Croatia has 79 inhabited islands. Not all can prosper and grow. Škarda is a living example of what islands would look like if people abandoned them. Island no longer has any registered residents has no boat connection, only got electricity recently. It does have a handful of houses that are the best example of simple island life. It feels like you walked into a museum. Its southern bay still has a small fortress with a canon used to keep pirates away hundreds of years ago. If you want to add some history and reflection on contemporary topics to your kayaking holiday, I recommend Škarda. Fiberglass boat in Croatia? Susak is your kind of place. Full speed ahead as you launch on one of it’s sandy beaches. It is an island completely covered with sand which is brought to Adriatic by river Po and currents deposit it on a former islet – today full sized sandy island. Instead of maquis and pine trees, expect Giant Reed. Paddle past a horse that is grazing grass next to an airport runway. Turn around the point and see a picturesque town of Unije. Houses rise up a gentle slope just over a long pebblestone beach. In many ways, it is similar to many other smaller islands in Croatia, but it still keeps the raw and real vibe of a relaxed fishing village. Excellent launch point for your kayaking holiday. If you have less than a week to spare, it is an ideal spot to island hop and see history, nature, and adventure all within a days paddle. Sites are scattered on islands Dugi Otok, Zverinac, Ist, Silba, Škarda, and Sestrunj. If you have a week or longer, then Molat is an optimal launch point for exploring the remote, raw and non-touristy islands in Croatia. Go as far north as Mali Lošinj, Unije, Susak and Ilovik. On the photo above, one of the sandy beaches on Molat's south coast. I admit: we are biased towards places off the beaten path, places that are hard to find and even harder to reach. This is what sparks our inspiration. There are other places too - biger, touristy and just easier. It's may be nice to sometimes paddle there, too. Oh, and we are still talking about islands. Down around Dubrovnik I was leading kayaking trips on Elafiti islands. 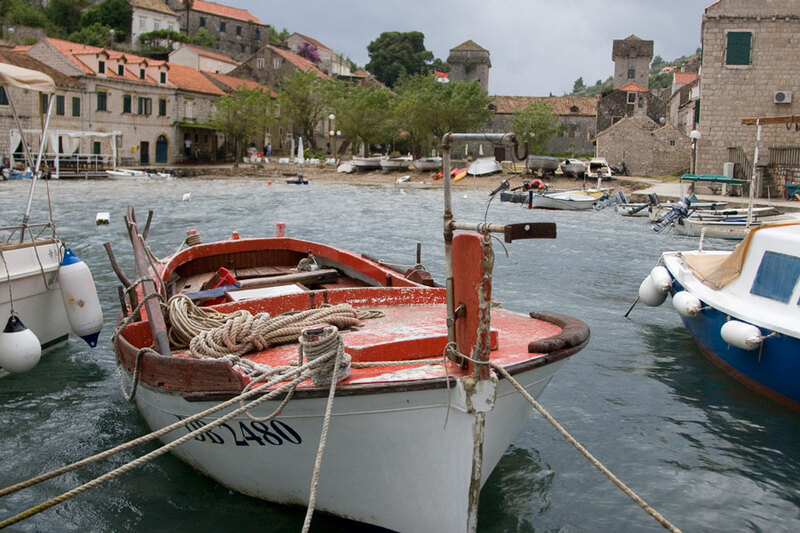 The hub for such trips is Lopud. A lovely but small little village with some rennisance villas and more recently, some larger hotels. Definitely on the touristy end of the spectrum with a heavy share of Dubrovnik’s traffic making it to the islands. Paddling has some nice cliffs and beaches. Koločep is the ‘wildest’ of the three Elafiti. Small towns and big rough coastline. The highlight of this island is a cliff shaped like a dome. Even if you aren’t into rock climbing it’s a fun place to paddle to. Apart from that, this island has a very interesting Rennaisance feel to it. In the south, it’s Suđurađ and in the north Šipanska Luka. Both getting busy due to daily connection to Dubrovnik. 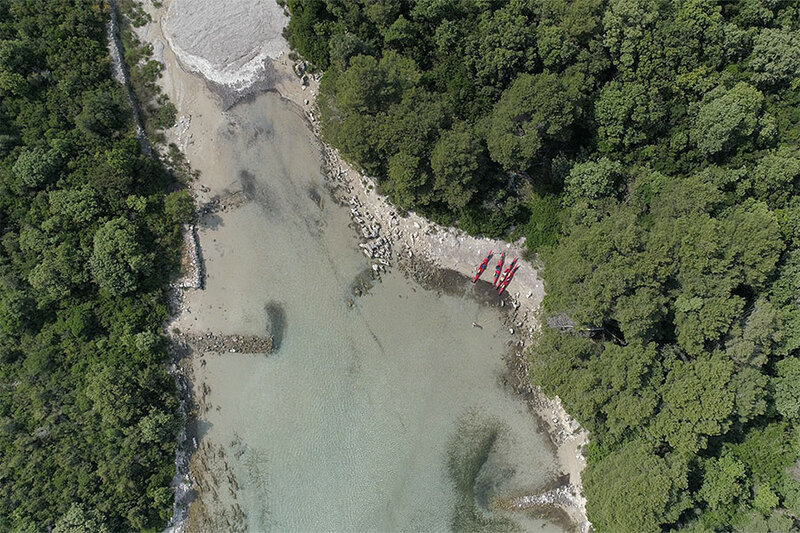 UNESCO protected national park Mljet is an interesting paddling place. On the outer, western facing side of the island, expect super interesting rock formations. On the north facing side, there are little touristy hamlets that cater to charter sailboats and larger boats. The area around Šibenik is another interesting paddling ground. Šibenik town is built on the estuary of river Krka. 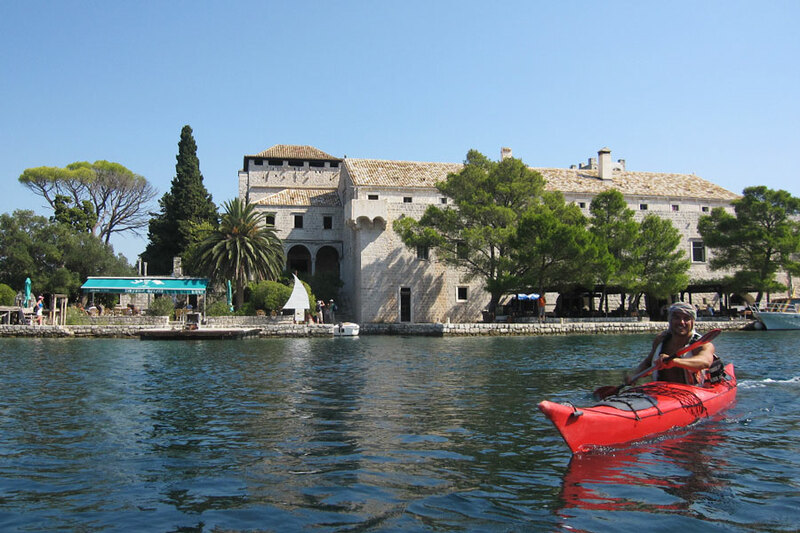 Going up the estuary takes you to Skradin – entrance point to Krka National Park. I found it fun to paddle between the high cliff bases on the sides of the river. Water is more river murky then typical Adriatic sea crystal clear. 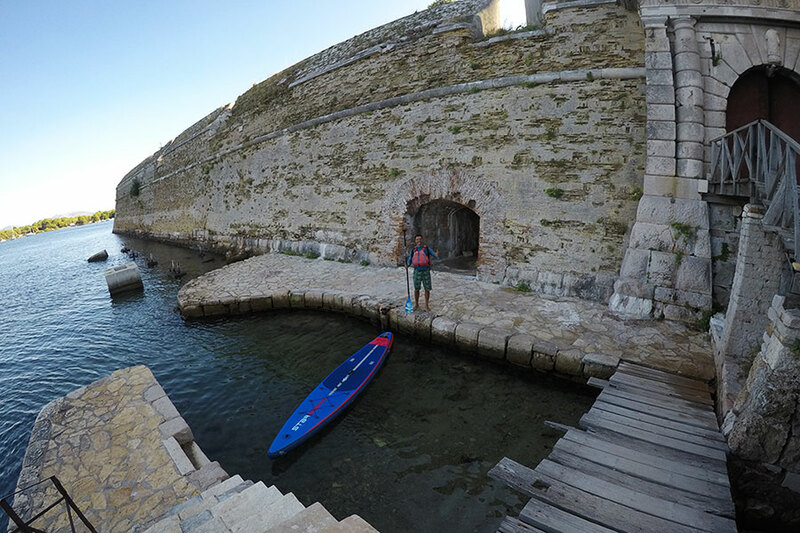 Paddling out of Šibenik to the open sea there are some submarine caves and St. Nicholas fortress – a ruin today, but a testament to the former military might and importance of Šibenik as a military harbor. It was built in 16th century to prevent Turkish boats from reaching the port. I hope you don't mind the fact that I only have SUP paddling photo from the site. Complement this post with an overview of best moments from our adventures in 2018 and an essay on top 6 reasons to do your adventure travel trip to Croatia.